Rutland News & Scuttlebutt The latest poop and opinions about modeling the Rutland. Remembering the Milk Trains Modeling tips and prototype information - and not just the Rutland! Rutland Q&A Questions and answers to your Rutland quandaries. The Green Book of HO Scale Brass Milk Cars Milk Cars: who imported what and when in brass. Hopper No. 10009 Bill Badger Bill started with Bowser's PRR GLa. Pacific No. 80 Phil Kuczewski Phil converted an Atlas 4-6-2 into a Rutland K1. Flanger X111 Don Janes Don details his assembly of the Rutland Car Shops kit. Don Janes does it again. Amazing! Milk Car No. 394 Don Janes Don's beautiful rendition of this converted reefer began as a Rutland Car Shops kit. Tips for weathering the exposed interiors of 1700 and 4100 series wood gondolas. Don explains how he "mass produced" a set of resin parts in order to construct a roster of these classic Rutland vans. Tips on painting and lettering an ex-DL&W car. Ray scratchbuilt this little Rutland jewel. Don duplicated this Danby, VT landmark in HO scale. Detailing, painting and lettering a Walthers Jordan Spreader for the Rutland. A "four window" van from the RPI/F&C kit. A stock Funaro & Camerlengo kit brought to life. Another nicely weathered model from Jim Otto. A step-by-step kitbash of these unique milk cars. 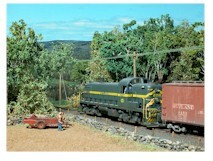 A scratchbuilt model in HO scale. This is a Rutland Car Shops model of an Addison Branch station with an attached milk shed. A freight reefer converted to milk service in HO scale. Don started with an Athearn light Mike a created a masterpiece in HO scale. Includes a complete parts list. Steel Baggage No. 129 Bill Badger Bill decribes his assembly of the Rutland Car Shops kit. A regular on the Mount Royal kitbashed in HO scale. Stafford Swain helps us render an accurate addition to our Mount Royal consist. Mal Houck weighs in on maximizing brass express reefers. Note: other models that are not specifically Rutland are featured in the Milk Train section. Railworks Forum (10/12/99) Railworks HO scale brass models of Rutland & New York Central passenger, milk and express cars. Plus: how to apply those filmless decals that come with the models!!! Railworks Forum 2001 n/a Railworks and Boo-Rim raise the bar yet again with another batch of beautiful combines and milk cars. Westerfield The finest freight car craftsman kits available...and now including Al's beautifully rendered Rutland NYC-design box cars. Bethlehem Car Works BCW markets and sells the remaining stock and future releases of Rutland Car Shops. Highball Graphics Manufacturer of decals of interest to the Rutland modeler, in both HO and O scales. Lots of milk car decals, and more are on the way! Rutland Car Shops RCS was the source of many rolling stock and structure kits with a Rutland theme. They are now marketed by Bethlehem Car Works. Jim Shaughnessy The Rutland Road is back in print, as is Delaware & Hudson. Autographed copies are available direct from the author. Steam Shack Roger Dumas' hobby shop is located in --of all places-- Rutland, Vermont. Home of the exclusive HO scale Rutland PS-1 box car. Vermont Hobby Depot Located in Woodsville, Vermont. Lots of New England stuff. Steve's Depot Located in Burlington, MA, Steve's Depot is The Source for DCC components and factory-trained installation. Steve is a great guy, too! Click the thumbnail image on the left and step into some scenes from Lou Sassi's incredibly realistic modules.